In case anyone needs help with the terminology of millennial studies, I have a glossary in my lecture notes. The study of millennialism did not begin with the build up to the year 2000. Theologians, sociologists and anthropologists had been writing for decades (in the case of the theologians, for centuries) about the end of the world and about the ways that people react to that prospect. After a long period of subcultural obscurity, the subject again came to the notice of the general public in the 1980s, and a flurry of academic and journalistic treatments appeared in the 1990s. Among the most theoretically ambitious was this book by Stephen O'Leary, Associate Professor in the Annenberg School for Communication at the University of Southern California. "Arguing the Apocalypse" attempts nothing less than a "general theory" for millennial studies, one that could help relate the many disciplines that have dealt with one aspect or other of the Last Things. The book develops the theory through a detailed examination of two familiar episodes of apocalyptic thinking in American history, the Millerite Movement that culminated in the "Great Disappointment of 1844," and the return of date-setting premillennialism that began, very approximately, with the publication of Hal Lindsay's "Late Great Planet Earth" in 1973. The theory is useful, though the book does share some of the defects of late 20th-century literary studies. (I hope never to see the words "rhetor" and "topoi" again.) The historical exposition is gripping, and the author's insights are essential to anyone interested in the field. "Apocalyptic" is really a term for a genre of biblical and apocryphal literature that flourished in the Near East around the beginning of the Christian era. It deals with a class of ideas that are part of the broader category of eschatology, the study of the final or ultimate things. The latter also includes questions addressed by philosophy, cosmology, anthropology and other disciplines. The aspect of eschatology that usually attracts the most interest, however, is the study of what societies do with apocalyptic literature, particularly with the prophetic books of Daniel and Ezekiel in the Old Testament, and the Book of Revelation in the New. The most conspicuous social manifestations of apocalyptic ideas are often called "millenarian" or "millennial," with reference to the thousand-year reign of the Saints, or "Millennium," mentioned in Chapter 20 of the Book of Revelation. (To put an extraordinarily complicated matter quickly, "millenarian" usually refers to violent or even revolutionary expectations for the future, while "millennial," a more general term, can also refer to hopes for gradual improvement as history nears its end.) Though not all eschatological systems, not even all models of history, necessarily have a moral dimension, O'Leary deals with apocalypse as a solution to the problem of theodicy, of how God can permit evil to exist in the world. Essentially, the apocalyptic solution is that God will not permit evil indefinitely, and in the final accounting, all the suffering in history will have been justified. There is a considerable literature that attempts to explain all or most millennial activity in terms of some single sociological or psychological cause. Class conflict was an early contender, but equally plausible cases have been put for millennial activity as a delayed reaction to disaster, or as a reaction to modernization, or as a manifestation of one kind of mass psychological pathology or another. "Arguing the Apocalypse" starts with the sensible observation that there is no obvious single cause underlying all the millennial activity in the world, but that there is quite a lot of similarity in the way that people talk about it. 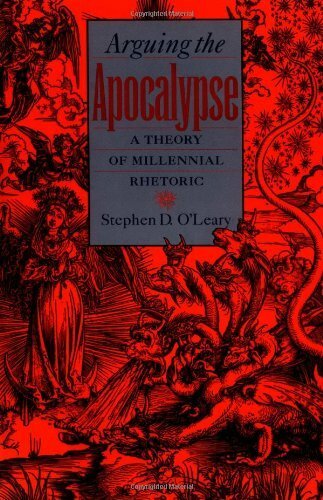 The beginning of wisdom in the understanding of millennial behavior, in fact, is the appreciation of the fact that apocalyptic rhetoric is persuasive. By examining millennial activity from the perspective of rhetoric, O'Leary is able to look at texts, the "rhetor" who expounds the text and the rhetor's audience as an interactive system. "Arguing the Apocalypse" amplifies the long-standing thesis that apocalyptic is essentially a form of drama. (This is particularly the case with the Book of Revelation, which looks for all the world like a classical Greek play; it even has a chorus.) Now drama, according to Aristotle, comes in two flavors. There is tragedy, which features good and evil characters who proceed to an inevitable catastrophe. Dramatic plots tend to be about how sin is met with revenge. Comedy, on the other hand, is about foolish or mistaken characters who stumble into a happy ending. Error is cured by enlightenment, eventuating in reconciliation. The Book of Revelation has both tragic and comedic strands: the Beast and his followers prosper mightily in this profane age but meet with everlasting punishment on the last day, while the sufferings that the Saints endure in this age are all set right at the end. These tragic and comedic strands also appear in the history of millennial movements, often as pure types. The Second Great Awakening, a generation of reform and revival that characterized the first few decades of the nineteenth century in the United States, produced just about every possible form of millennial activity. It's earlier phase, however, was predominantly postmillennial in theology. This Awakening was associated with a variety of reform movements, from the abolition of slavery to the prohibition of alcohol. These movements were attended by acute religious fervor. When some of the reform movements made little or no progress even after years of mass rallies and evangelism, however, some members of the generation of the Awakening began to doubt whether real reform was possible in the current world. The result was a turn toward premillennialism, manifested most spectacularly in the Millerite Movement and the Great Disappointment of 1844. William Miller was a respectable farmer in Upstate New York who came to believe, probably about 1830, that the Second Coming would occur around 1843. A diligent amateur student of scripture, his authority was arithmetic, as applied to the complex prophetic number system of the Old Testament prophets and the Book of Revelation. The transparency and reasonable tone of his argument seized the imagination of a large fraction of the public. Respectable and learned ministers from many denominations either embraced Millerite ideas wholeheartedly or expressed sympathy for them. (Miller himself was an influential voice rather than a prophet in the movement. Indeed, the date of the Great Disappointment, October 22, 1844, was not set by Miller, but welled up out of the movement.) Publications with large circulations sprang up to spread the doctrine, and the mass meetings used to promote the reform movements of the earlier phase of the Awakening were put to new uses. As O'Leary notes, all this activity was not intended solely to persuade people. Proselytism was supposed to be one of the features of the latter days. By proselytizing, the Millerites were not just telling people about the apocalypse; they were enacting it. The Disappointment itself was dealt with in various ways. The kernel of the Millerite movement decided that the event actually foretold by Miller's computations was an event in Heaven that prepared for the earthly Second Coming at some imprecise point in the future. Many went on to found the Adventist movement. Other Millerites threw themselves into the Abolitionist movement. O'Leary reports that the fiasco of 1844 ensured that, for a long time to come, only the most marginal rhetors would dare set a specific, near-term apocalyptic date. However, we should also note that the turn to premillennialism evidenced by Millerism survived the Great Disappointment, at least in evangelical circles. After the end of the Civil War, the historical pessimism associated with premillennialism was one of the factors that induced evangelicals to recuse themselves as much as possible from public life and practical politics. There are many reasons why evangelical Christianity returned as a public force in the last quarter of the 20th century. One of the chief reasons, as O'Leary notes, was that history was making their worldview more plausible. The Jews really had returned to Israel, something that evangelical eschatologists had been talking about for over a century. Furthermore, the invention of the atomic bomb made the apocalypse something that everyone could believe in, one way or another. Indeed, not only did premillennialism again challenge the implicitly postmillennial "civic religion" of the United States, but apocalyptic date-setting came back, too. O'Leary is at pains to emphasize the differences between Millerism and the brand of apocalypticism that Hal Lindsey promoted in his fantastically popular books that began with "The Late, Great Planet Earth." Their scenarios were different, for one thing. Although the doctrine of the pretribulation rapture of the Saints existed in the 1830s, it was not incorporated into Millerism, and did not really become important until after the Civil War. Lindsey's future, in contrast, contains both the prospect of another world war and a pretribulation rapture of the Saints to Heaven that would save believers the trouble of living through the final struggle. The difference that chiefly impresses O'Leary is that, granted their premises, the logic of "The Late Great Planet Earth" is much shakier than that of William Miller and his followers. Lindsey's warrant for starting the countdown to the end is the assurance given by Jesus in the Olivet Discourse that "this generation" would see the fulfillment of all apocalyptic prophecy. In Lindsey's model of history, the machinery of salvation paused when the Jews failed to accept Jesus as the Messiah. Salvation history started up again only when Israel was founded in 1948. (This approach is called "dispensationalism," as opposed to the Millerite "historicism.") "This generation," therefore, refers to the people who were alive in 1948. In his earlier work, Lindsey made bold to wax more specific. Alleging that a biblical generation is about 40 years, he speculated that 1988 would be a reasonable date for the rapture to occur, followed by seven years of tribulation, and then the Second Coming. Even granting the greatest deference to scripture, these interpretations are not obvious. That was not the case with the Millerite computations: they may not have been correct, but were reasonably clear. Furthermore, Miller and his colleagues invited criticism and answered their critics in print, something that Hal Lindsey never did. Nonetheless, while Millerism was extinguished in a bit over a decade, the apocalyptic revival of which Lindsey was so conspicuous a part is not completely extinct, even after 30 years. This is partly because Lindsey's system was tentative enough to avoid outright disconfirmation, even after the end of the 20th century. A factor that was at least as important, perhaps, was that evangelicalism has gained a measure of cultural acceptance, and even political power. O'Leary devotes an interesting chapter to the conservative revival of the 1980s, and particularly to the eschatological aspects of the Reagan Administration. This period posed a problem for apocalypse-minded conservatives. Not only was the clock running out on the best-known estimate for the rapture, but evangelicals now needed a theory that would justify them in helping to reform a society that was doomed in several senses of the word. In O'Leary's nomenclature, they needed to move from the tragic frame to the comic frame. To a limited degree, this is what they did. In his later books, Hal Lindsey held out the hope that conservatives could keep America out of the hands of the Antichrist right up to the rapture, if they all pitched in to aid the process of conservative reform. This was an exhortation to his readers to become tragic heroes, united in the last stand against the forces of darkness. Ronald Reagan became, in effect, "President of the Last Days" for some of his supporters. Like his medieval type, the mythical Emperor of the Last Days, his reign ensured present safety, while in no way compromising the inevitability of apocalypse in the more distant future. Televangelist Pat Robertson went even further in his serious though failed bid for the White House. He stopped making premillennialist predictions of doom entirely, and began to speak about the future with the sunny optimism of a postmillennial preacher of the early Second Great Awakening. The strategy did not lessen the suspicion in which the press held him, though it did cause his erstwhile supporters to suspect him of backsliding on doomsday. Still, what did not work for Pat Robertson may work in other contexts. "Arguing the Apocalypse" ends with a meditation on just what we are supposed to do with the apocalypse. There is obviously no getting rid of it. O'Leary suggests that the best course would be to seek to keep it in the comic frame. The idea seems to be that the apocalypse can be permanently tamed by turning it into the ever-receding horizon on the road of progress. People might still dread impending disaster, but they would not think some final disaster to be inevitable, and so would not be tempted to historical fatalism. While there is something to be said for this strategy, we should keep in mind that the comic frame is not coextensive with postmillennialism, or St. Augustine's amillennialism. Even if the images of disaster and judgment in the Book of Revelation are taken as metaphors whose application is never exhausted by any particular event in history, that does not mean that ultimate questions are not posed by historical events. To take the most obvious example, even if all persecutions are types of an ultimate persecution by Antichrist that never arrives, martyrs throughout history have nevertheless been killed just as dead as the hypothetical Tribulation Saints are supposed to be. To make the apocalypse immanent or episodic does not lower the stakes. The opposite, rather. This is the real meaning of the saying of Franz Kafka that O'Leary quotes: "Only our concept of Time makes it possible to speak of the Day of Judgment by that name. In reality it is a summary court in perpetual session." John maintained the HTML for his website by hand. I also starting making webpages in the late nineties, and that was just how you did it. As such, he had indexes by topic for his major interests, for example eschatology. I debated recreating these for a long time, but I finally decided to do it because a few items slipped though the cracks of the blog-centric chronological method I had been using to repost John's writings. This also gives me an opportunity to escape the tedium of John's topical political blog posts from twelve years ago. While nothing looks more dated than old scifi movies, old political controversy is an especial trial to read. Thus, let us move on to this short book review of a book that never existed, combining John's interests in eschatology and alternative history into one! This item is Alternative History. The Second Coming did not actually occur in 1844. The Great Disappointment is a real hisrorical term, however. Look under Eschatology for the review of Arguing the Apocalypse. The Millerite Movement and its sequel are, for obvious reasons, the most studied manifestations of mass millennialism since the New Testament period itself. Indeed, so carefully has this grand finale of America's "Second Great Awakening" been examined that one may wonder whether there is anything new for historians to say. Certainly the author of the present study does not aspire to novelty. Rather, "The Great Disappointment of 1844" performs the invaluable service of sifting through the last generation of scholarship on the subject to provide a narrative that is both readable and current. The optimism of America in the early decades of the 19th century was reflected in the "postmillennial" view of history that underlay the great outbreak of religious revival and social reform that we know as the Second Great Awakening. Postmillennialism, as all students of eschatology know, was the doctrine that the Second Coming of Christ would occur at the end of the thousand year reign of the Saints, the Millennium foretold by Chapter 20 of the Book of Revelation. The implication was that the Saints would themselves put the world in order in preparation for the great event. The Second Great Awakening was in fact characterized by a high level of political and cultural engagement by Christians. The reform movements of the time, from Abolitionism to Women's Suffrage to the Prohibition of Alcohol, began as aspects of postmillennial religious revival. While some progress was made on these fronts, the failure of the reform movements to remake society as a whole caused many persons to despair of the possibility that the world could be perfected purely by human efforts. The time was ripe for a return of premillennialism, the doctrine that the Second Coming would inaugurate rather than conclude the Millennial kingdom, which would then develop under divine guidance. The name that became inextricably linked with the triumph of premillennialism was William Miller, a respectable farmer and keen amateur student of scripture living in northern New York State. His reexamination of the dating of people and events in the Bible, set alongside certain familiar interpretations of the complex prophetic number systems of Daniel, Ezekiel and Revelation, convinced him that the Second Coming would occur around the year 1843. Though his analysis was multi-layered, a key feature of his logic was a demonstration that a proper calculation of the generations mentioned in the Old Testament showed that Bishop Ussher, who had famously announced that the world had been created in 4004 BC, had in fact underestimated the age of the world by a good 150 years. Thus, the six-thousandth year of the world would occur in the first half of the 19th century. Then would begin the "Seventh Day of Creation," a concept long associated with the Millennium. William Miller was not the first student of scripture to set a near-term date for the Parousia. Still, he was a little unusual in the transparency of his argument and his willingness to engage critics. Miller was never the "prophet" of Millerism; his authority was arithmetic, not personal revelation. It was possible to disagree with his calculations, and many people did. Still, the argument was of such a nature that it could not be merely dismissed; it had to be refuted. William Miller reached his conclusions about the dating of the Second Coming about 1830. He soon began to disseminate them in print and, more diffidently, on speaking tours. His message took on a life of its own, becoming the template for an interdenominational network of evangelists and publications. People abandoned their ordinary affairs to propagate the gospel of the last days, often giving away their property or neglecting to plant their fields. The precise date for the great event, October 22, 1844, did not come from Miller, or indeed from any of the leading figures of the movement. Rather, it appeared among the mass of believers, who overwhelmingly gave it immediate acceptance. Of course, as we now know, the prediction was correct. The study of the Parousia Event of 1844 naturally overshadows the Millerite Movement (as it does the contemporary Taiping and Babist movements). However, the Days of the Presence required the creation of a new historiographical discipline, which the present study only briefly outlines. The Millerite story picks up when coherent documentation again begins to become available in January of 1845. Against the unsettled economic and cultural landscape of the early Millennial world, Millerism presents the not unfamiliar spectacle of a movement destroyed by its own success. The ironic details are well known. Even historical survey courses devote some attention to accounts of the attempts by exasperated Millerites to regain control of property that they had given away, sometimes by arguing in court that they had been temporarily insane during the months leading up to the Advent. Far more important, however, was the fact that Millerism, and premillennial Christianity in general, had nothing to say to the Millennium. The movement had come into existence as a reaction to the theory that Christians, as Christians, had a duty to leaven the world. Premillennialists had consciously recoiled from the labor of formulating a social philosophy, or even a coherent political program. The Millerite Movement had been entirely about chronology. Though the train left at the expected time, the premillennialists found that they had no idea where they were going. This vacuum at the heart of post-Millerite evangelicalism had profound implications for the role of religion in the English-speaking world during the 19th and 20th centuries. It is a commonplace among historians that the great events of those years, the US Civil War and the First and Second World Wars, were to a greater or lesser extent "Wars of Armageddon," fought by societies for reasons that were essentially millenarian. All the great social movements of the period were also informed by the millennialist "Social Gospel." However, though evangelicals took part as individuals in the general historical process, they did not engage the great issues on a soteriological level. It was only in the last quarter of the 20th century that they began to emerge from the isolation of the denominational subcultures into which they had retreated. The end of the long alienation of a large a fraction of Christianity can only be applauded. We will never cease to experience the influence of the events of 1844. Even the completion of the current Sabbatical Millennium will not nullify the process that began with the Parousia of that year. However, there are stories within that greater story, some of the saddest of which deal with the disappointment occasioned by the fulfillment of prophecy. Those stories can have an ending. Thus, though the historical debates may go on, we may hope that the long afterlife of Millerism is at last drawing to a close. John read these things so you wouldn't have to. However, I think his reviews were often more interesting than the actual book. This is the second installment in the "Left Behind" series. These novels are set in the Last Days and deal, as the name suggests, with those "left behind" by the pre-tribulation rapture of the saints. Apocalyptic novels based on similar assumptions have been proliferating in recent years (the earliest ones, according to Paul Boyer, appeared in the 1930s), and for their intended readership terms like "pre-tribulation rapture" require no explanation. However, for this review a few words of explanation might be in order. The eschatological system which the novels presuppose has been increasingly influential in evangelical circles since the end of the Civil War. As the 20th century ends, it may be the most popular Christian eschatological system of any description. To put the matter briefly, pre-tribulationists hold that the saints, meaning all people who have been saved, will be miraculously removed (raptured) from the world in the years leading up to the disastrous events that precede the Second Coming of Christ. These disasters will for the most part occur in a period called the "tribulation," which is most commonly expected to last seven years. During that time, the world will be ruled by Antichrist, who will persecute the new crop of saints that rises up in the wake of the rapture. He will also first make peace with the Jews, and then seek to destroy them. After his overthrow at the Second Coming, the world will be ruled directly by Christ for a thousand years, in the "millennium" properly so-called. Having been told this, you know pretty much what the structure of the series is like, and indeed what the structure of all the books in the genre is like. The rapture itself occurred in the first volume, "Left Behind." This book, "Tribulation Force," is set in the period when the tribulation proper begins, the trigger being the treaty that Antichrist signs with Israel. This installment concludes with nuclear weapons being used to suppress a revolt against the Antichrist's world government. While events of this nature might have a certain intrinsic interest (at least the first time you read about them), the material must be sufficiently familiar to most of its readers as to raise the question of what exactly the point of such exercises may be. The answer seems to be two-fold. First, in many cases, apocalyptic novels are fundamentally pastoral tracts that deal with everyday issues. (Of the co-authors of this book, Tim LaHaye is a pastor; Jerry B. Jenkins specializes in religious fiction). Second, though apocalyptic novels generally project the prophecies of Daniel and Ezekiel into the contemporary world, to a large extent this seems to be merely a matter of form. The appeal of the stories may really depend on their resonance with 20th century history. The "force" of the title is a little group of new Christians who gather to study bible prophecy in the short period before all religions but that of the Antichrist's newly-created world cult are outlawed. Many of these persons were not aware that they were not Christians before the rapture occurred, of course. Their leader is a formerly luke-warm pastor in the suburbs of Chicago. He had just been going through the motions before the beginning of the end of the world got his attention. His flock seems to consist primarily of professional people with technical educations (which may or may not tell you something about the book's intended readership). Though naturally concerned with biblical prophecy, the pastor spends most of his time dealing with the sort of problems that pastors in the suburbs of Chicago deal with even when the world isn't ending. Much of the book is in dialogue, and at least a third of the dialogue concerns the difficulties young Christian singles face while dating. Curiously, the authors wholly ignore the implications of 1 Cor. 7:29 for family formation at the end of the age. Counseling aside, this is still an apocalyptic novel, and such interest as it has must rest in its portrayal of the contemporary eschatological imagination. The Antichrist in this story is a rather bureaucratic fellow. He parleys his job as General Secretary of the United Nations into the position of world potentate, as you might expect, and then sets about building a world capital on the site of ancient Babylon. To me, at least, this seems like the kind of concrete-and-kickback project the UN likes anyway, so it is hard to see what makes him peculiarly diabolic. Far scarier is his ditzy executive secretary, who uses the immense power of her outer-office to play practical jokes on people. This is one of those protestant evangelical scenarios in which the incumbent pope is among those raptured, only to be replaced by either Antichrist or one of his minions. In this case it is the later, a liberal American cardinal who takes the reignal name of Peter. There is in fact an old tradition that the last pope will be called Peter II. However, in a book where "Pontifex Maximus" is rendered as "greatest pope" and cardinals are addressed as "your Excellency" (rather than "your Eminence"), this detail is less likely to be due to thorough research than to dumb luck. A natural implication of novels like this is that the armed militias may be onto something. In the story, the country really is turned over to the New World Order, and the militias' stockpiling of weapons against that event turns out to have been prescient. Not, of course, that it does them much good. The revolt in which they conspire with the much-reduced American president to overthrow Antichrist results in the nuking of several American cities. "Tribulation Force" is hardly a call to arms. Indeed, the force of Tribulation saints with which the book is concerned never does anything more militant than build bombshelters on the sly. Additionally, the Antichrist here does not appear to benefit from the support of an elaborate infrastructure of institutional treason of the sort posited by true conspiracy buffs. His power lies in his personality rather than his connections with the Illuminati. One sometimes gets the impression from books of this genre is that their preoccupation with Israel and the Jews is an arbitrary fifth wheel. In this book, the Antichrist is moved to make a treaty with Israel because he wants the rights to the agronomical discoveries of an Israeli botanist. The secret formula can make the world's deserts bloom, or something, but this motive does not seem to be very integral to the story. Similarly, though the Temple is being rebuilt in Jerusalem as all this is going on and there is a great proliferation of rabbinical characters, all these things seem to be happening in a universe other than the one that contains the suburbs of Chicago, despite the fact the main characters visit Israel so that everything cane be explained to them. Apocalyptic novels have more in common with secular dystopias than is generally realized. So far, at least, the "Left Behind" series is really about the rise of a totalitarian government and its effects on the lives of ordinary people. It is not a great leap of speculation to suggest that Antichrist novels have flourished in the 20th century because the period's history has made nightmarishly intrusive governments easy to imagine. In the century of Hitler and Stalin and Mao, the anticipation of Big Brother and Antichrist makes a certain sour common sense. The Oatmeal clearly agrees with JohnOne notable disagreement of mine with John was the competence of the terrorists who struck the United States on 9/11. I'm sure lots of people, especially at the time, saw bin Laden as a terrorist mastermind, but in retrospect it seems like he got lucky. It is probably the kind of books I read, but a real mastermind would have followed up with something else a little sooner. There certainly were some foiled plots that made it into the news after 9-11, but most of the subsequent attacks were in other countries, such as the London subway attacks, the Beslan school hostage crisis and the Bali nightclub bombing. It is at least conceivable that the vast new powers given to the American intelligence agencies after 9/11 have kept us relatively safe, but I'm not terribly impressed by this idea. The rate and scale of pre- and post-9/11 terrorist activity seems about the same in the wider world. And most of that activity happens in Third-world shitholes, just like it always has. Thomas Friedman suggested in the New York Times of May 19 that we could use an office like this. The column in question, "A Failure to Imagine," was actually a backhanded exoneration of the Bush Administration for failing to take more radical action last summer, when there was an uptick in information from intelligence sources suggesting that an major attack from Al Qaeda might be impending. He rightly points out that the sort of imagination needed to consider suicide attacks seriously is rare in America. He was probably kidding when he said that a special bureau might be created to cultivate malice at that level, so we are not blindsided again. Most of Friedman's piece, however, is devoted to bemoaning the Administration's "failure to imagine good," meaning in this case the mobilization of youth for progressive causes and the institution of a post-fossil-fuel industrial revolution. Thomas Friedman is not the stupidest man who ever lived, but he does not seem to grasp how far from "over" the 911 era is. He has company, of course. The Democrats last week jumped on some quite minor disclosures of internal intelligence documents from just before the attacks to go into full Watergate mode. "What did he know and when did he know it?" they demanded to know, reacting to word that the president received a rather anodyne analysis last August that suggested some sort of attack might be in the offing, perhaps involving airline hijackings. The answer to the question, of course, is "not enough" and "too late," for which the Administration is indeed to some degree at fault. Ironically, the partisan way in which the question was raised seems to have done those who raised it more harm than good. In any case, those who look on 911 as a lost opportunity of some sort can take heart. Similar opportunities may come along any time now that they could find just as useful, assuming they survive the attacks. One need not be altogether cynical to surmise that the latest statements coming from the Administration about new threats for the near future are colored by the desire to change the subject from the Democrats' implied accusations of negligence. However, there is no reason to think that the new threats themselves are imaginary: stories about terrorists having recently been brought to the US in cargo ships, for instance, appeared before last week's disclosures. So did the reports that shopping malls could be in particular danger. Actually, cynicism might be in order if you thought that the president's partisan opponents knew about the new dangers. Did they take care to get their accusations on record before possible new attacks? That way, they could position themselves for this fall's Congressional election, when they might raise questions about the Administration's competence. But no, that way madness lies. We do seem to be moving into a new situation. Al Qaeda has a track record of launching simultaneous attacks against large, geographically distant, landmark structures. These attacks are made with novel tactics determined by the nature of each target, at intervals of from several months to over a year. The new pattern of terrorism in the Middle East, however, as developed in the intifada against Israel, involves numerous attacks at short intervals. They follow one or two patterns, and they are intended to create casualties. It is reasonable to expect that a synthesis of these methods will be deployed in the United States, by an alliance of hitherto only loosely connected groups. Places of mass public accommodations have been mentioned as possible targets. So have such structures as high-rise apartment buildings, where preparations might be made over time. For what little it's worth, I doubt that landmarks or the transportation systems are very attractive targets anymore. Then again, that's what people said about the airlines until last September. Public reaction to new attacks could differ significantly from last year's. For instance, it will be clear that government has only limited ability to protect the people from attack, even when government is paying attention. The Administration would be criticized, not for over reacting in terms of new security measures, but for having done too little. Additionally, depending on where the attacks take place, they could disabuse some parts of the country of the impression that the 911 war is primarily a concern of the Northeast. "The evangelical movement encompasses one-quarter of Americans and is growing quickly. One measure of its increasing influence is that a newsstand in the United Nations has carried the Left Behind series of religious novels by [Jerry Jenkins and] Tim LaHaye. These books, which have sold 50 million copies so far, describe the battles that precede the Second Coming, and there is indeed a United Nations connection: In the novels, the Antichrist is the secretary general." Speaking of Left behind, I finally got around to seeing the movie version, by the Lalonde brothers of Cloud Ten Productions. The authors were displeased with the quality of the film, and it does in fact seem to be the kind of thing that HBO produces for broadcast during the summer, when few people are likely to watch. One thing that struck me about the film was the number of pets. After the Rapture, the world was filled with despondent dogs sitting by the empty clothes of their departed masters. While I recognize that this idea would be theologically awkward, I could not help but think how much more affecting those scenes would have been had there been empty collars and dropped leashes lying next to those abandoned clothes. The cats would have been left behind for the Tribulation, however. They would have worn little red capes and sprung about in evil glee, knowing that their hour had come. This short review contains much of the material, in embryo, that I used to craft some popular lectures I have given on millenninalism. The basic distinction between kinds of millennial belief, its cross-cultural appeal, and the combination of wide popularity with elite dismissal. I can't imagine ever wanting to read this novel, but I learned a great deal from John's review of it. That was a big reason I kept going back to his site. According to Paul Boyer in his study of prophecy belief in America, "When Time Shall Be No More," the apocalyptic novel has been a feature of American popular culture since the 1930s. At any rate, it has been a feature of that portion of popular culture inhabited by certain types of Christians, particularly premillennialists. ("Premillennialism" is the variety of belief about the end of the world which looks forward to a literal Second Coming of Christ, followed by the reign of the Saints for a thousand years on earth, a period called the "millennium.") Not so long ago, popular eschatology (the study of "the Last Things") was off the radar screen of secular America entirely. Then, starting in the 1980s, the notion began to seep into elite consciousness that maybe the traditional secular scenarios for the future did not exhaust the views of history to be found in American culture. It wasn't so much the great commercial success of Hal Lindsey's "The Late Great Planet Earth" that drew enlightened attention to the phenomenon. Despite their supposed fascination with the inner meaning of "popular culture," American elites ("agnostic Swedes ruling a nation of pious Hindus," in one famous formula), have an astounding capacity for overlooking popular enthusiasms until they blow up in their faces. It was not until President Reagan began talking along much the same lines that some people began to pay attention. In recent years, of course, militant millenarianism has indeed blown up in several spectacular and bloody incidents. The subject is no longer obscure. For a variety of reasons, it is worth keeping an eye on. Traditional eschatology has sometimes provided the theme for works that found a wide audience in the post-WWII era. The film Rosemary's Baby in the 1960s is an example. Still, it is rare for an apocalyptic novel, one whose incidents include the reign of Antichrist, the Tribulation and the Descent of the New Jerusalem, to be pitched to a general readership. Certainly it is something of a novelty to see such a book written by a man who, as recently as seven years ago, was a reasonably plausible candidate for president of the United States. People interested in divining Pat Robertson's political agenda will have no trouble finding relevant material in this story. Not altogether incidentally, the book is even more interesting for the ways in which it alters the classical themes of the genre precisely to appeal to a wider Christian readership, and specifically to Roman Catholics. The endtime scenario of popular American apocalyptic reached its mature phase just after the Civil War. It has been remarkably stable ever since. It involves a period of growing crisis, culminating in some universal threat or disaster. The chaos of the times affords a charismatic person the opportunity to seize control of the world by promising to restore order. This tyrant, who turns out to be no one other than the Antichrist himself, is often the current pope, or is supported by the pope. Before his period of misrule can begin, however, the true Church (various defined) is wonderfully withdrawn from the world in an event called the Rapture. Some people remaining on earth can still hope to be saved, but they must suffer persecution by the Antichrist, who will gradually turn his government into a religious cult, with himself as an object of worship. The period of his reign is normally coincident with the Tribulation, which in most narratives lasts seven years. By the end it, the Antichrist seems poised to snuff out the remnant of the Tribulation Saints. However, then the Second Coming occurs, the Antichrist is destroyed, and the Millennium begins.